ClaimTek features the most modern, comprehensive and professional medical billing software system on the market today. Our MedOffice® Practice Management software was designed to handle the billing functions for all types of specialties with ease. When you start a medical billing service it is important that you promote your business as using the most comprehensive, accurate, failsafe and feature-rich software on the market. Here’s why MedOffice is your best choice if you intend to build a professional medical billing service that can respond to the needs of today’s fast-changing marketplace. For example, many web-based systems cannot handle both the CMS-1500 and the CMS-1450 insurance forms as well as billing for specialties like Dental and DME (Durable Medical Equipment). MedOffice® was built with the latest technologies. It was designed based on Microsoft.NET framework along with the powerful MS SQL 2005 database engine and Crystal reports! What does this mean? It means a feature-rich solid performance for the future of your business! MedOffice® features an attractive interface with colorful graphics, beautiful icons, and easy navigation that makes it so easy for you to work from your home office or through remote access from anywhere in the world! Furthermore, MedOffice is already set up to accept the new National Provider Identification that every doctor must begin using. Many other medical billing programs are not. ClaimTek's MedOffice® software is the MOST advanced medical billing program for use in a professional medical billing business. MedOffice® performs every function that a professional biller needs. It can generate insurance forms, submit claims electronically, and prepare valuable claims submission tracking and follow-up financial reports for your providers. 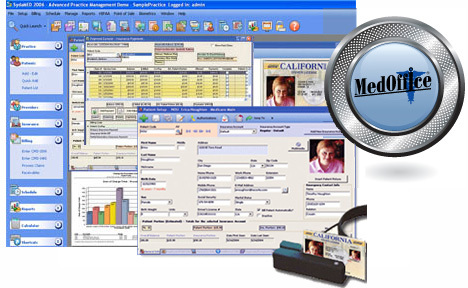 MedOffice® simplifies the claims filing process and ensures accuracy in medical claims filing and patient billing. In addition to processing claims, MedOffice® medical billing software allows you to provide a range of additional services for your medical clients including: printing and mailing patient statements, posting receivables to popular accounting programs (such as QuickBooks), generating referring physician analysis reports, performing soft collections, tracking and comparing managed care payments with fee schedules, outputting patient and insurance "aging" reports (which show unpaid claims), creating sophisticated practice management reports for your providers, producing mailing labels, creating and updating management and financial reports -- and much more! The hottest trend in medicine today is Electronic Medical Records (EMR). Doctors are finally recognizing that they need to abandon their old habits of keeping paper records for every patient and convert to using EMR. EMR software offers substantial savings in time, efficiency, accuracy and money for medical offices. EMR systems allow doctors to write up their patient histories and patient notes right when the patient is there, avoiding costly medical transcription and lost time on nights and weekends dictating notes. EMR reduces the volumes of paper files and charts that overflow doctor’s offices and that often get easily lost. EMR also ensures more accurate patient charting, as Medicare will not pay claims when a doctor’s handwriting is so sloppy that it cannot verify the patient records if there is ever a challenge to a claim. If you use a web-based browser billing system you’re in trouble because EMR software does not coordinate with such systems. Doctors will react far more positively to your business when you can tell them that your software coordinates with their EMR software. And even better, when you work with ClaimTek, you’ll become a distributor of EMR software because ClaimTek is the only company that has forged strategic alliances with two of the leading EMR software makers. Some companies claim that Internet-based software takes the problem away from you to ensure that the software is updated on a regular basis. But think about – don’t you want to know when your software changes? Isn’t it smarter to know what types of changes are being made? ClaimTek’s MedOffice ensures that you won’t have to worry about updates. We’ll tell you when we have a new update you might benefit from and we’ll help make sure it gets downloaded and installed on your computer if you are running a desktop setup. If you are running MedOffice on our server, we take care of the updates for you.